The past week or so has been very memorable here in the UK. The Olympics kicked off to an outstanding opening ceremony last friday, which made me laugh and marvel in equal measure. Ok, I’m biased, but I thought that it’s quirky, eccentric nature pretty much summed up us Brits. No amount of money spent on an opening ceremony, past or future, can trump the fact that Her Majesty gamely played herself with Mr Bond as part of the ceremony itself. How cool and even the non royalists out there must have had a sneeky smile on their faces. As for Mr Bean – what a great touch to include him as part of the ceremony; he was definitely one of the highlights. It was fun, original and gamely humorous and had all of us glued to the TV screen for over three hours, wondering what Danny Boyle was going to bring out of the hat next. I think it is safe to say he is a ‘slam dunk’ for a knighthood in the coming months. Since the Games begun I have been glued to the TV watching the swimming in particular. Mike Phelps gaining his 19th Olympic medal making him the greatest winner the Olympics has ever seen -truly remarkable. Also the spectacular performance of China’s Ye Shiwen, who, at 16 years of age, wins gold in the women’s individual medley. It’s addictive viewing watching the world’s best athletes compete in such a wide variety of sports. I’m going to see the men’s beach volleyball soon, which should be fun and a little surreal to watch in central London. 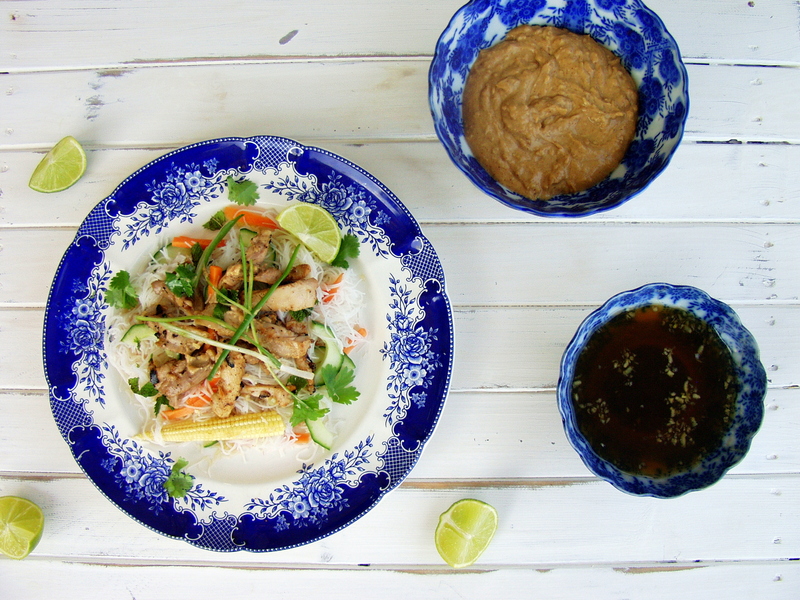 We’ve had some good sunny days recently, which always inspire me to cook fragrant Asian dishes that are not too heavy. 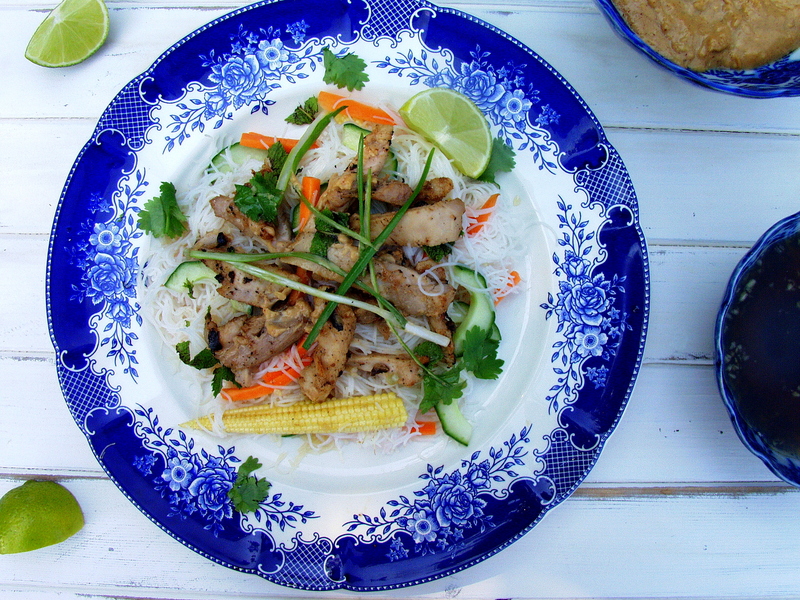 This recipe I stumbled across really recently and it caught my attention as it was served cold and could almost be classed as an Asian noodle salad, of sorts. I’ve cooked it a few times already and I have to admit it’s really good. My number one fan (Big A – who is 6) gave it a definite 10/10. It was originally posted in the New York Times, however, I found it on the hugely popular food bloggers site ‘Smitten Kitchen‘. As with all great recipes, Deb Perelman – from Smitten Kitchen, adapted hers from the original and I changed hers a little bit further. For example, I omitted chilli, as I was feeding it to Big A, Little Z and my father who all don’t eat chilli. That said if I were feeding it to just adults (or chilli loving adults) I would definitely add the chilli (hence it has remained on the list of ingredients), I added only one large cucumber, added baby sweetcorn, slightly more rice noodles. For the really observant amongst you, you will have noticed that I completely forgot to scatter the crushed roasted peanuts over the dish for all the photos. When I sat down and started eating the meal I remembered but clearly too late for the shots for this blog post ! 1. Begin by making the ‘dipping sauce’. On a low heat, place all the ingredients into a pan and gently stir until the sugar has been properly dissolved – this will only take a few minutes. Place in a small serving bowl and allow to cool. 2. Next you need to make the ‘peanut dressing’. Place all the ingredients into a small food processor and puree all the ingredients so that you are left with a thick creamy sauce. Pour into a serving bowl. 3. In separate large bowl pour approximately half of the dipping sauce and a third of the peanut dressing and stir together. Add the chicken to the mixture and coat thoroughly using your hands. Leave to marinate for at least 15 minutes. 4. Once the chicken is marinated gently heat up a griddle pan and add a little toasted sesame oil and brown the chicken thoroughly on both sides, which will take a few minutes per side. I cook my in batches so that I can be sure that the chicken in properly cooked through. As an alternative you could grill the chicken for 20-25 minutes. 5. When the chicken is cooked, chop into bite sized pieces. option 1: Place everything on a large serving platter with the noodles, chicken, vegetables, dressing and marianade all separated out and then your guests/family can help themselves. option 2: Divide the cooked noodles into individual bowls or plates. In a small bowl toss the vegetables with 1 tablespoon of dipping sauce. Place the vegetables and chicken onto each bowl/plate. Place a further 2 teaspoons of dipping sauce and dressing to each helping. Add the herbs, peanuts and spring onions to each bowl and serve. Note: As an alternative to baby sweetcorn you could add fresh peppers which work equally well. 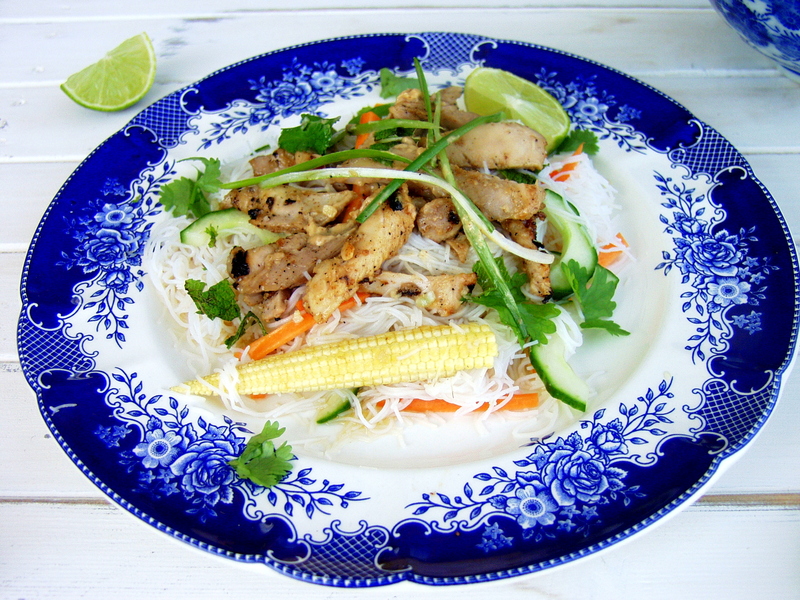 This entry was posted in Chicken, Salad, Vegetable and tagged baby sweetcorn, carrots, chicken, david tanis, lime, peanut butter, peanuts, rice noodles, smitten kitchen, summer, sunny days, The New York Times, Vietnamese. Bookmark the permalink. I missed the Opening Ceremony. I couldn’t find the program that was broad casting in Jakarta. Good to read your thoughts on the ceremony! I like Smitten Kitchen, too. Cold noodles are great in a hot weather!